One of the highlights of being part of the Groundworks Team is having a schedule of events at my fingertips. So whilst consulting the literature for some visitors I noticed that an evening of conversation was planned with the renowned artist Peter Doig and immediately booked myself a seat. The evening did not disappoint despite the sudden monsoon type drenching I received on my way down to the Woodlane campus. The easy conversation between curator Matthew Higgs, (director of the influential alternative art space White Columns in New York) and former colleague Peter flowed effortlessly and provided a unique insight into Peter’s career. The two former RCA colleagues have made a special visit to Cornwall’s shores to curate an exhibition in St Just at the Jackson Foundation Gallery featuring the Afro Caribbean artist Denzel Forrester. The evening led us through Peters last thirty years as an artist and being in London at the time of the YBA movement in the 1990’s. Noted for their shock tactics, use of throwaway materials and oppositional and entrepreneurial attitude the YBA group of visual artists received an abundance of media coverage. Peter lived in London for 30 years and moved to Trinidad in 2002 after which the Tate Britain held a retrospective of his work in 2008. Born in Scotland but a resident of Canada and Trinidad for most of his childhood both have had an influential effect on his work. In 2007, White Canoe set a record for the highest price for a piece sold by a living European artist. 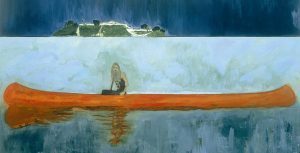 This 11 million price tag was surpassed by Doig’s enchanting piece Swamped, which went to a new owner for 26 million, then again last year when “Rosedale,” of a Toronto snowfall, went to auction and was sold to a telephone bidder for 28 million. Peter’s visit to Cornwall is noteworthy not only to celebrate his artistic achievements but also for his involvement in the curation and promotion of Denzel Forrester’s work in St Just. From Trench Town to Porthtowan will be on show from May 26 – June 23rd, 2018. The exhibition presents a career-spanning collection of Denzel’s large-scale paintings which explore a diverse range of themes from sewing bags with his mother to the world of London’s dub reggae clubs.